How many tickets are available for each tour? Tour groups are kept small so that all participants have the best experience possible. By having a maximum of 15 people on a tour this ensures everyone can see and hear. The tours has been developed with a 16+ audience in mind and at times they touch on information which is of a violent or sexual nature. Children above the age of 14 are welcome however, providing they are accompanied by an adult who accepts responsibility for their safety and understands that they will be exposed to potentially graphic content. The tours are roughly 2-3 miles and take, depending on questions, up to 2 hours to complete. It is important therefore that appropriate shoes are worn. Will a tour be cancelled in wet weather? A tour will go ahead if wet weather is forecast so please ensure you bring suitable outdoor attire with you. If extreme weather if predicted, such as snow or storms, a tour may be cancelled at the discretion of Lawless London Tours. In this circumstance 24hrs notice will be given as well as a full refund. Who is responsible for my safety whilst on the tour? Lawless London Tours take place in busy areas with lots of pedestrian and vehicular traffic. Whilst we have endeavoured to include quieter streets within the tour route, it is inevitable that there will be major roads to cross. It is therefore essential that tour participants are aware of their surroundings at all times and take responsibility for the safety of their persons and belongings. 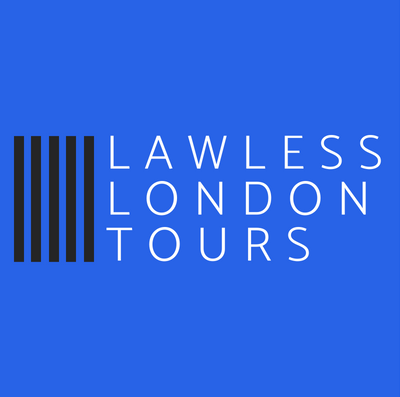 Lawless London Tours do not accept liability in the event of an accident or theft. Can I get a refund if I’m unable to attend? Yes, refunds are available up to 24hrs before the tour is scheduled to take place. The privacy of customers is important to us and we take care to safeguard it. Information will be used and stored in accordance with data protection laws and other applicable legislation. Customer data will be stored on a secure database. All personal data will be anonymised after you have completed a tour and used only for customer analysis. Email addresses will be stored and used for sending marketing material only. You will be able to unsubscribe from these emails at any time. No customer data will be shared by us with a third party.